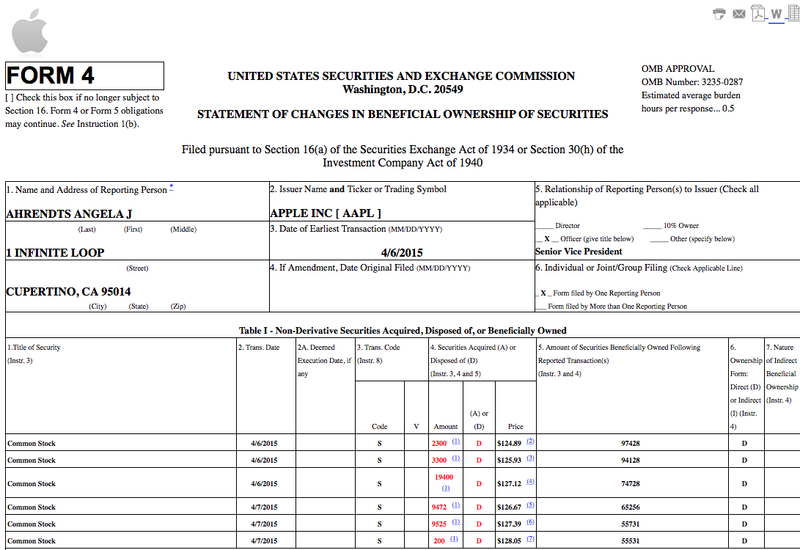 An SEC filing shows that Apple’s SVP of Retail Angela Ahrendts sold AAPL stock totalling $6M in the week in which the Apple Watch hits stores. It’s nothing out of the ordinary for Apple execs to sell shares from time to time, either to fund a purchase – like a house – or, perhaps more likely given the timing, to pay a tax bill. Ahrendts was given a compensation package worth $73M when she joined the company, just over $70M of it in stock. Apple explained that the amount partly reflected that she walked away from $37M in unvested Burberry stock – shares she would have received had she remained with the company but lost by leaving. Around 40% of the total sum she is due to receive from Apple is subject to performance requirements. Given the company is about to embark on what is easily its most complex retail launch ever, with Ahrendts attempting to direct Apple Watch and 12-inch MacBook sales online, she may be feeling just a little nervous at present. The SEC filing can be seen below.